The farm keeps the whole family busy: Alessandro (biologist, nature guide and Sommelier), Elisa who looks after the administration, Mauro and Paola, retired but full time busy on the farm. And we hope that in the future even Emma, Guido and Bernardo will give us a helping hand. Cipresso: It’s the largest apartment (140 square metres). It has got 3 double rooms with a double bed, a spacious and bright living room, kitchen, bathroom with shower and bath. 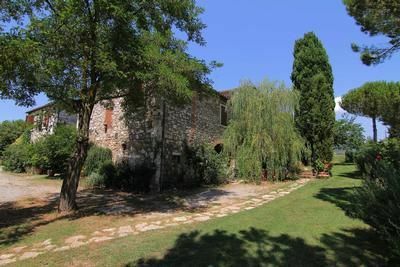 It’s situated on the 2. floor of the main building and its windows overlook the beautiful village of Serre di Rapolano and the evocative Sienese countryside. Gelso: Its position right in the heart of the medieval farm makes it the most fascinating apartment. It has got 1 double room with a double bed, a living room with sofa bed, kitchenette, bathroom with shower. Pini: The apartment has been recently renovated and is furnished with sober elegance. It has got 1 double room with a double bed, living room with double sofa bed and fireplace, kitchen, bathroom with shower (suitable for disabled people). The apartment is equipped with satellite-TV and has got a large, independent and fenced garden. Acacia: The apartment has been recently renovated and is furnished with care. It has got 2 double rooms, kitchenette, living room with fireplace, bathroom with shower. The apartment is equipped with air-conditioning and has got a large, independent and fenced garden. Pomo: Recently renovated, this apartment has got 2 double rooms, 2 bathrooms, kitchen and a private, fenced garden. It can be rented completely or divided up into a two-roomed apartment and a bedroom with bathroom. - Cot for children: once per object for rent at a price of 25 EUR (optional). - Intermediate cleaning: per object and day Costs amounting to 15 EUR (optional).